If a Mediterranean, Adriatic, or Baltic cruise is on your 2012 travel wish list, check out the $1,776 July 4th sale fares now being offered by Windstar Cruises (must be booked by July 6). Windstar, which operates three tall-masted luxury ships – 312-passenger Wind Surf and 148-passenger Wind Star (shown at left in Greece) and Wind Spirit – has lowered fares on 20 European voyages sailing from mid-July to mid-November (with some fall voyages priced as low as $1,476 and December Caribbean voyages priced from $976). 7-day Istanbul to Athens (or vice versa): Both Wind Star and Wind Spirit are sailing seven-night itineraries through late October that let you experience two great cities, fascinating Istanbul at the crossroads of Europe and Asia and historic Athens with its must-see Acropolis and museums, plus fun-in-the-sun islands such as Mykonos, Santorini , and Rhodes as well as the Turkish beach town of Bodrum and the legendary ancient ruins at Ephesus. 6-day Rome to Barcelona: The line’s largest ship, Wind Surf, sets sail from Rome on October 29 (fall is a great time to enjoy a few pre-cruise days in the Eternal City) on a glamorous itinerary that calls on five ports on the Italian and French Riviera (Portoferraio, Portovenere, Monte Carlo, Cannes, and St. Tropez) before ending in fascinating Barcelona. 7-day Rome to Rome: If exploring out-of-the-way Mediterranean islands is your thing, this October 6 itinerary on Wind Surf is ideal. It begins and ends in Rome and visits magical Capri (and nearby Sorrento on the stunning Amalfi Coast), Lipari (one of the Aeolian islands off of Sicily), Elba (where Napoleon was exiled), and Corsica (a mountainous French island). 7-day Oslo to Le Havre (and vice versa): Priced at $1,476, this pair of seven-night voyages on Wind Surf (July 20 and August 26) visits five countries and the less-traditional cruise ports of Oslo; Amsterdam; Antwerp, Belgium; Dover, England; and Le Havre, France – a great itinerary for beer and art lovers. 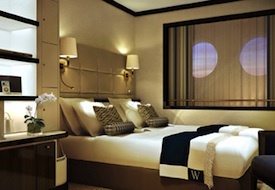 All three ships have just undergone stateroom renovations and now feature updated contemporary decor in sophisticated neutrals (shown at right). Wind Star’s public spaces have also been refurbished, while Wind Surf and Wind Spirit’s public spaces are due for their renovation in November.